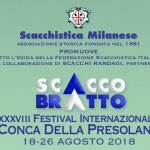 38th Conca della Presolana is held from 18 to 26 August in Bratto, Italy. The tournament is divided in 5 sections. In Masters group 49 players are taking part, among them 11 GMs.